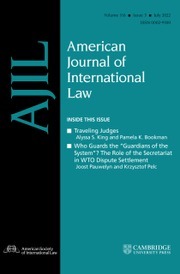 AJIL is a leading peer-reviewed journal, published quarterly since 1907. It features articles, essays, editorial comments, current developments, and book reviews by pre-eminent scholars and practitioners from around the world addressing developments in public and private international law and foreign relations law. The Journal also contains analyses of decisions by national and international courts and tribunals as well as a section on contemporary U.S. practice in international law. AJIL and AJIL Unbound are indispensable for all professionals working in international law, economics, trade, and foreign affairs. 2-year Impact Factor 1.907. ASIL members should log in to the American Society of International Law​ webpages to gain access to the full AJIL archive. AJIL Unbound supplements AJIL’s print edition by publishing short, original essays of international legal scholarship on this website. Featuring timely essays written in a readable style accessible to policymakers, practitioners, and students, AJIL Unbound seeks to broaden and diversify the scholarly exchanges begun in the pages of AJIL and to introduce new ones online.